The modern retro market is booming and where once it was a niche for a few manufacturers, it is now a profitable sector across the board. There are an endless number of machines to choose from. And while they retain much of their classic styling to appease the retro loving eye, there is nothing old school about their functionality. 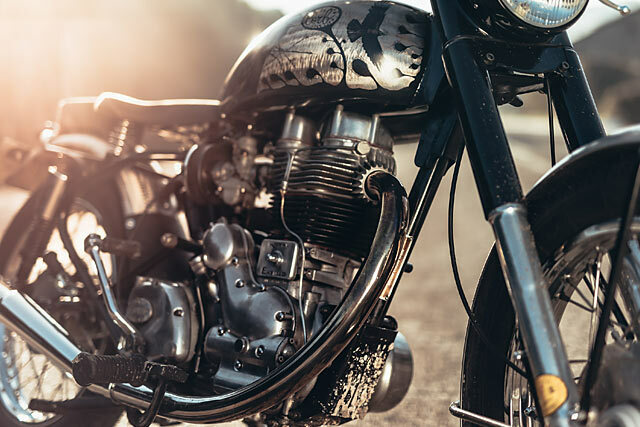 A Royal Enfield is really the only modern machine that gives that true vintage bike feel; chunky gearbox clicks and a bike that you ride and doesn’t ride you. Santiago García of Corb Motorcycles in the beautiful Catalonia region of Spain craved just such a machine. 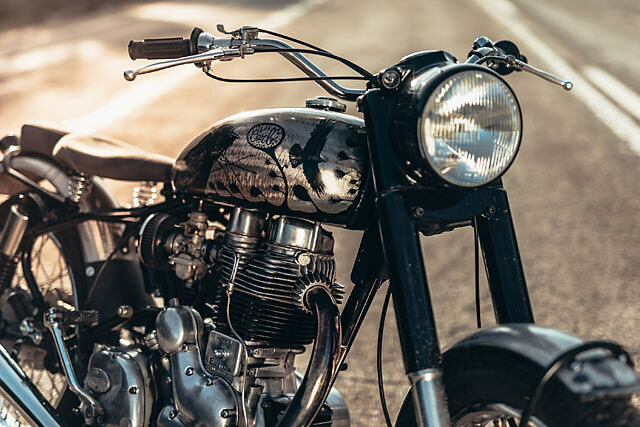 So he created a 2003 Royal Enfield Bullet known as “The Raven 500” – a fitting doff of the cap to classic British engineering. 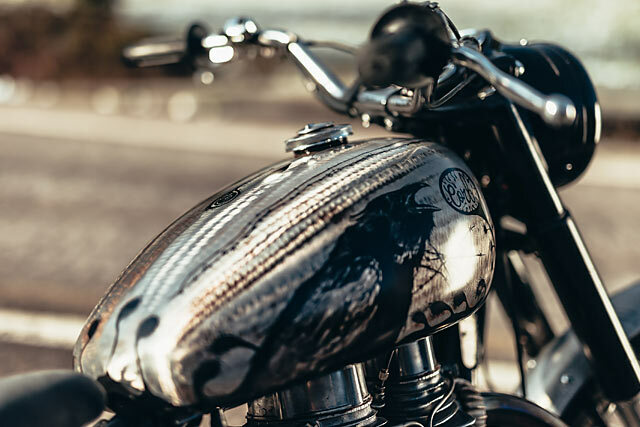 The old school feel goes beyond just the desire to build a true modern classic; it’s also the philosophy behind the way Corb Motorcycles functions. “We are not a shop. 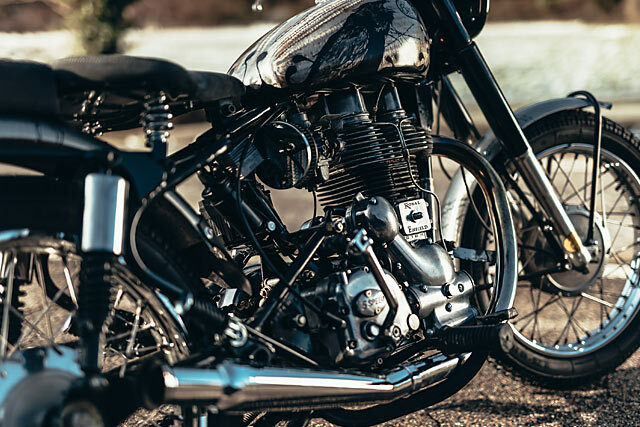 I work from a garage with dedication and passion for motorcycles,” stresses Santiago. This is not a place you go to buy a T-shirt and get a Cafe Latte in the waiting room. It’s a greasy garage, with quality old tools, that is all about taking time and doing the job right. 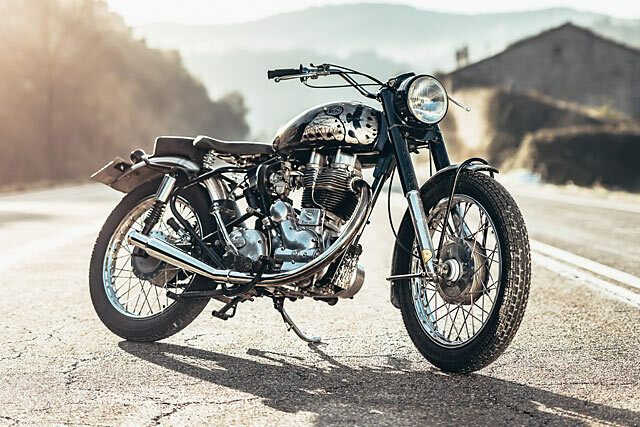 Santiago had always wanted an Enfield and when his friend’s Dad put this 2003 model 500 up for sale, he quickly snapped it up. There was never really any intention to modify the bike and it came in excellent condition. Like much of Europe, Catalonia has a winter period of snow that means 200hp superbikes stay inside and a bike like a Royal Enfield is perfect for those wanting to brave the icy roads. 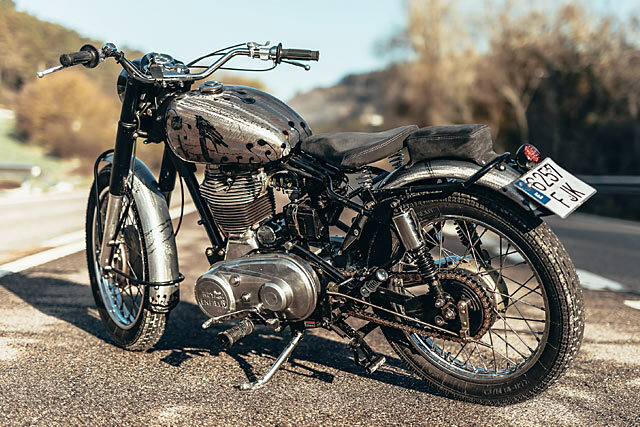 But when the Enfield’s starter motor bearing gave up the ghost, it set in motion a build that was never meant to be. But if he was going to customise the Royal Enfield, it would be done to fly the flag for the Corb Motorcycles brand. Corb means ‘Crow’ or ‘Raven’ in the local Catalan language and along with old school British cool it gave the inspiration for the build. With the clutch cover off and the starter removed, the bike takes another step back in time with Santiago deciding to leave it kickstart only. From here, truth in form and simplicity in function would take over the entire build. With the bike having come with the larger of the Bullet tanks, Santiago swapped it out for the smaller unit and stripped off all the paint. 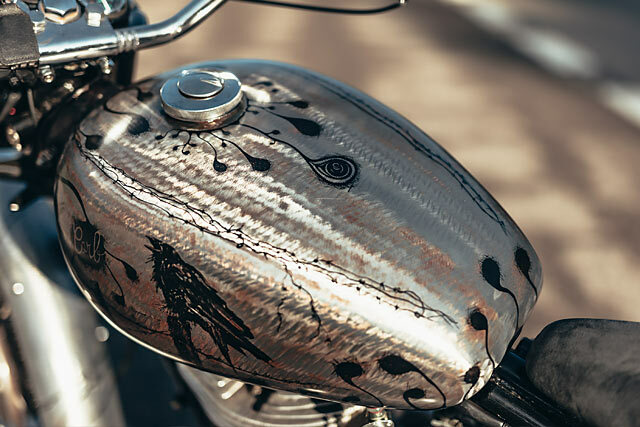 The oil painting finish of the tank is courtesy of talented local artist and friend of Corb Motorcycles, Osiyuyu. The desolate environment accentuated by the rust coming through steel, the Raven of death and barbed wire all reminiscent of the environments the bike traverses as the cold, harsh Catalonian winter sets in. The new tank and paintwork mean that the side covers and oversized seat would just never do, so both were junked and the subframe cut back. In their place, a new seat support was welded in and a raw steel fender bolted to the frame. The seat itself started life as a Biltwell solo in white, but was handed over to local upholsterer Tapiceria Nico. He took the white leather off and replaced it with a dark grey Alcantara, before stitching on the same to the harlot pad for a passenger. With so much bulk removed, the unintended consequence was that the wiring and the battery that would normally be covered were now exposed. But with no starter to fire, Santiago was able to switch to a much smaller battery and simplify the wiring before neatly tucking it away. 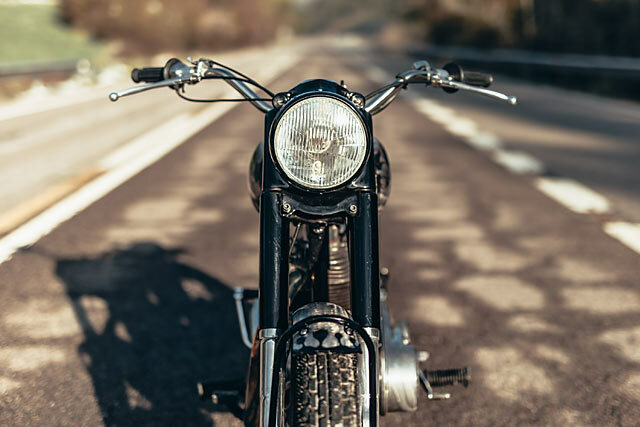 The all-black battery with an old school leather strap gives the vintage vibe, while mini LED indicators and taillight provide the perfect visual minimisation. The modern levers and controls the 2003 Bullet comes with were switched for vintage items and the look was spot on. But if the looks say ‘vintage’, the power train lets you feel it from the seat of your pants, and a quick look at the engine’s exposed oil lines let you know what you’re in for. The 499cc single matched up to a 4 speed box is never going to deliver the win at the traffic light grand prix, but that’s not the point. Releasing the mechanical sound of the old Brit, Santiago pulled off the factory airbox and fitted a round pod filter. But the true magical sound comes from the cocktail shaker muffler that is straight through and only silenced by the dB killer fitted in the mid pipe. The bike was all but done, so Santiago remounted the fenders for more of that old school, go anywhere feel. They now ride just a little higher over the classic Heidenau rubber. 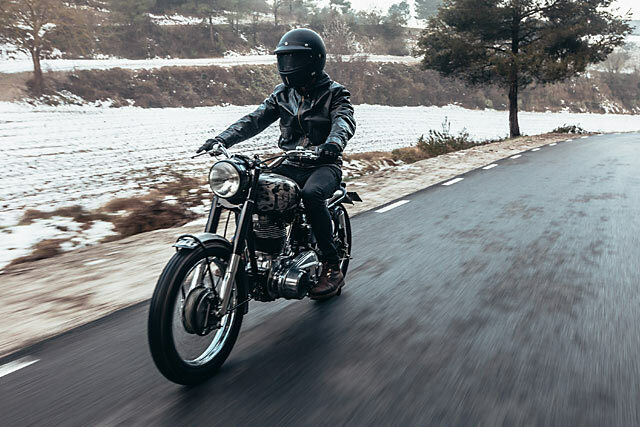 Taking the Enfield out into the cool country air, along the snow-lined roads and clicking purposefully through the gears, the Corb Motorcycles man had a realisation. This bike would not be sold. “It’s a bike for me, to go to the shows, to events and where people can admire it. 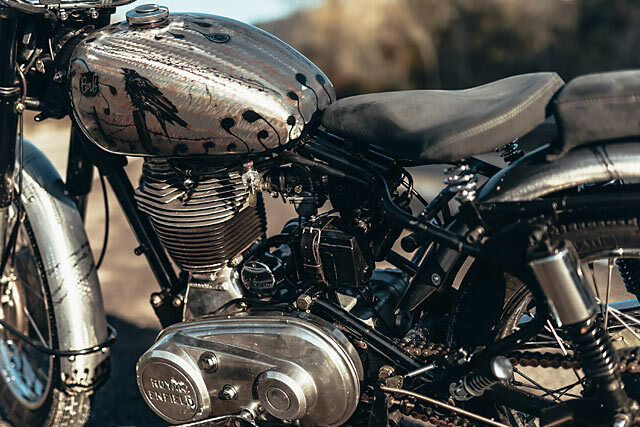 A motorcycle not to ride every day, but one for pleasure.” The Raven might be a symbol for death, but in this Catalan creation it proves the simple things in life are often the best.